+$We examine what's holding design students back, plus how we can move forward as an industry. +$A lot of graphic design courses don’t prepare students for the workplace. It’s a bold statement, but I think it’s true. +$We need to address this shortcoming by providing students with a pathway that is increasingly absent from our overburdened modern educational system. We need to reintroduce the fundamentals that underpin the design process. If done, such practices will help produce independent creative thinkers and secure the industry’s future. +$Here's more about what the problems with design education are and how we can attempt to fix them. +$When studying graphic design, I was taught by highly talented people from the industry, quality lecturers with industry experience. Today, there are so many courses where this talent pool has been spread too thin for students to get the design education they need. +$Furthermore, the way in which students have been taught is impacting how they are teaching the generations that follow. 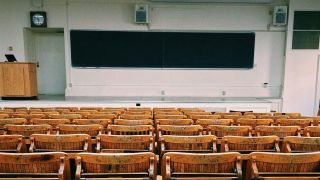 A generation of teachers is emerging with little or no industry experience, which means that the quality of learning is judged from an educational perspective rather than an education and industry-related one. When you add the reality of fewer jobs in a weakened marketplace and more debt than ever before to the equation, the end result is a harmful mix that is affecting the potential of students. +$So, to lay it bare, what I’m saying is that today’s education system is delivering students who don’t have the skillsets they need to go straight into a job. As part of my research into the state of the design industry, I contacted almost 100 companies across the country and asked them what they wanted from graphic design graduates, and what they felt they weren’t getting. The feedback was crystal clear: “They are not industry ready”; “Their portfolios look great, but they aren’t equipped to hit the ground running and do some work”; “They haven’t got what we’re looking for,” and so on. +$We need to better equip students for today’s workplace. Improving the quality of teaching is one element, but there is more we should do. The average size of classes needs to be reduced and returned to a manageable level and contact hours need to be higher. The design industry must take some responsibility and help the government to better communicate with educational institutions. We also need to provide greater financial help for students, through the use of bursaries and scholarships. +$Switching the focus to the course infrastructure, we need to find the ability to adapt learning to student ambitions. This agility is crucial to future-proofing the industry. We should be asking students about their hopes and dreams, not just giving them the sales patter to get bums on seats and money in the bank. We should be talking to students to learn what they want to do, moulding their learning experience accordingly. This kind of agility is currently not considered achievable on many courses because there are too many students and not enough lecturers. +$Another area that needs addressing with regard to providing industry ready skill sets, is the ability to integrate new technology as it emerges. More and more opportunities are coming from digital platforms. We need to be focused not only on where we are, but where we can be. We need to be looking at trends to help show us where to focus our attention. +$We must be more responsive and react quicker. For example, we need to have the ability to fully explore the design-related possibilities of 3D printing, augmented and virtual reality, and what they can bring to student设计组合+$and the creative industries. This would help give students the chance to add new elements and directions to their work, and give them the opportunity to collaborate with and work in other fields. We need to be filling new roles as they develop rather than reacting to change. +$However, at the same time, we must not lose sight of the traditional values and design processes that underpin everything that we do. Looking to the past can help inform the future. For example, we should be getting students to draw on paper and teaching them mark making, and making sure they learn the value of research and the development of ideas. +$Also, they should be working with traditional skills like screen and letterpress printing, and understanding the functionality of these forms. These design forms and others inform our design work today and how we design the future. They are just as critical to an industry-ready skill set for the modern workplace. +$In the fusion of art, craftsmanship and new technology, we’re seeing an update and a reimagining of the+$1923 Bauhaus Education Model+$. That school’s founder, Walter Gropius, had the right idea when he said: “Combine the creative activity of the individual with the broad practical work of the world”. +$Returning to finance, we have the scenario today where heavily debt-laden students enter the job market without the skill sets to earn what they need. We have a duty to support students in a better way, as they study and with help in finding employment. The latter can be built around industry connections of lecturers and industry figures who teach on courses. +$I’m not naive enough to think that the problems surrounding graphic design education can be easily fixed, but I do believe that what I’ve discussed and presented here can contribute to the solution.